Star hyperbranched polymers are formed when linear chains stretch out from a central cross-linked core. The internal cavities of these core-shell structures can be used to encapsulate smaller, hydrophobic molecules. Studies indicate that the strong chemical bonds in these materials prevent premature 'burst release' of cargo. The robust nature of these polymers, however, also creates ecological and toxic hazards at the end of their useful life. 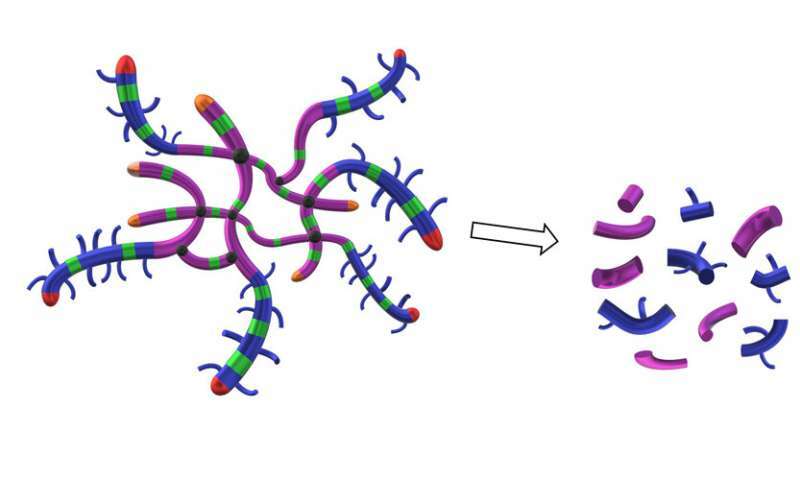 Alexander Jackson from the A*STAR's Institute of Chemical and Engineering Sciences (ICES) and colleagues have now synthesized star hyperbranched polymers that can both encapsulate drug molecules, and then biodegrade into smaller components. "Radical ring-opening polymerizations of cyclic ketene acetals have been understood for about 30 years," says Jackson. "The really exciting aspect of this research was to take this chemistry and combine it with modern techniques using 'living' polymer chains." Living polymerizations are so-called because they will continue to grow outwards upon addition of different building blocks. This gives chemists precise control over chain lengths and composition—critical features that are needed for advanced delivery devices. "We will use this approach to develop even more of these kinds of polymers, including degradable polystyrene and other acrylates," says Jackson. "This will prevent undesirable accumulation of these materials after they have delivered their cargo."